CHICAGO (Oct. 6, 2016) – U.S. Women’s National Team head coach Jill Ellis has named 24 players to the training camp roster ahead of two matches against Switzerland, on Oct. 19 at Rio Tinto Stadium in Sandy, Utah (7 p.m. MT on ESPN2) and Oct. 23 at U.S. Bank Stadium in Minneapolis, Minn. (12:45 p.m. MT on FS1). Ellis will name 18 players to suit up for each match. 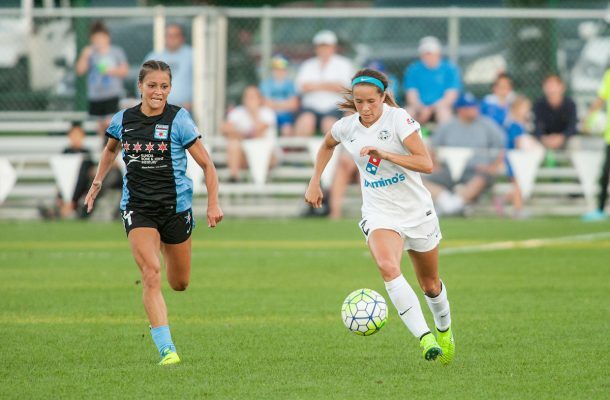 Chicago Red Stars midfielder Danielle Colaprico also spent time in WNT camps at the end of 2015 and beginning of 2016. For the other nine players, this is their first full WNT call-up. Ellis named 2016 NWSL Golden Boot winner Lynn Williams who scored 11 times for the Western New York Flash and two more in her club’s playoff semifinal victory over the Portland Thorns. Houston Dash forward Kealia Ohai also scored 11 goals during the regular season. She famously scored the game-winning goal in the 2012 FIFA Under-20 Women’s World Cup Final as the USA defeated Germany, 1-0, to win its third championship for that age level. The other collegiate players named were Stanford junior Andi Sullivan, a veteran of the USA’s 2012 FIFA Under-17 Women’s World Cup and the 2014 FIFA Under-20 Women’s World Cup teams, and BYU forward Ashley Hatch, who currently leads the nation in goals with 15. Ten of the 18 players that were on the 2016 Olympic Team were named to this roster, plus three of the four alternates. S. captain Carli Lloyd heads into the matches with 94 career goals and needs just six more to become the sixth player in U.S. history to score 100 times. First-time call-up Shea Groom from FC Kansas City was far and away her club’s leading scorer this year with eight goals. Among the four new defenders Ellis called up are two players from the Chicago Red Stars back line in Casey Short and Arin Gilliland, who both helped CRS limit opponents to 20 goals this year, tied for second fewest in the league behind the Portland Thorns (19). Ellis also called up defender Merritt Mathias, the first player from Alabama to be called in since World Cup and Olympic veteran Cat Whitehill retired. Mathias played in 19 of the 20 games for the Seattle Reign this year, starting 17. Former U.S. Under-17 Women’s National Team captain Abby Dahlkemper played every minute of every game this season at center back for the Western New York Flash and gets her first senior team call-up. The matches against Switzerland will only be the third and fourth meetings between the two countries, with the USA winning both previous contents. The Americans triumphed 4-1 on Aug. 20, 2014 in Cary, N.C. and 3-0 on March 6, 2015 at the Algarve Cup in Portugal. Switzerland has qualified for the 2017 UEFA Women’s Euro, taking the full 24 points from its eight games while scoring 34 goals and allowing just three. The USA is 18-0-3 in 2016. The match in Utah will mark the USA’s fourth visit to Rio Tinto Stadium – home to Real Salt Lake of Major League Soccer — after having played there in 2010, 2012 and 2014, all wins. The USA also played at Rice-Eccles Stadium in Salt Lake City back in 2003, a 5-0 win vs. Ireland. The match at U.S. Bank Stadium will be the first for a U.S. National Team at the brand new facility built for the Minnesota Vikings of the NFL. The fixed-roof stadium officially opened on July 22, 2016. The U.S. WNT has a long history in Minnesota as the team played many of its earliest home matches in Blaine, Minn., in 1986 and 1987. The U.S. Women have played 14 total matches in Blaine, tied with Portland, Ore., for the city that has hosted the most U.S. WNT matches, but the USA has not played there since 2006. Switzerland failed to make it out of Group C at the 2015 Women’s World Cup, but had a solid tournament, losing to eventual runners-up Japan 1-0 and defeating Ecuador 10-1 before suffering a fatal setback to Cameroon, 2-1.